The tradition of making the bonnach fallaid is only documented with the doughy bannocks, as far as I know, and there’s no mention of a ritual like that of the strùthan Mhìcheil being used in their making. However, if you find you have no luck with the dough recipe, or want a change, these are a good (and tasty) alternative and the ritual elements as with the strùthan Mhìcheil can easily be added in. 1. Measure out the oats and put in a large bowl. Beat the egg ready for adding to the mixture. 2. Heat the milk in a pan until it’s lukewarm. 3. Add the egg and milk to the oats. 4. Leave the mixture to stand for 30 minutes to allow the oats to soften and absorb the milk. 5. Stir in the baking soda and salt and heat a little butter in a frying pan or griddle. 6. Pour about a tablespoon of the mixture into the pan and flatten the mixture out into a round cake about a 1/4 inch thick. 7. 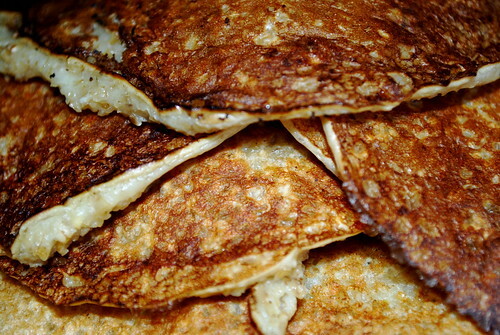 Any bannocks that break are traditionally considered to be an ill omen and are not used. 8. Fry on a low-medium heat until the bannock is sturdy enough to turn without breaking, then turn and fry the other side until the whole cake is thoroughly cooked. 9. Serve nice and warm with cheese or jam. These bannocks are fairly soft and moist so extra butter isn’t really needed (though tasty).